The vision painted by Domenico Fetti. 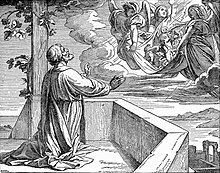 Illustration from Treasures of the Bible by Henry Davenport Northrop, 1894. 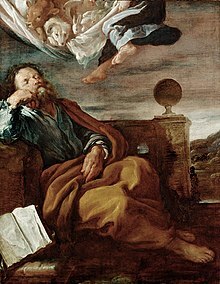 According to the Acts of the Apostles, chapter 10, Saint Peter had a vision of a vessel (Greek: σκεῦος, skeuos; "a certain vessel descending upon him, as it had been a great sheet knit at the four corners") full of animals being lowered from heaven (Acts 10:11). A voice from heaven told Peter to kill and eat, but since the vessel (or sheet, ὀθόνη, othonē) contained unclean animals, Peter declined. The command was repeated two more times, along with the voice saying, "What God hath made clean, that call not thou common" (verse 15) and then the vessel was taken back to heaven (verse 16). At this point in the narrative, messengers sent from Cornelius the Centurion arrive and urge Peter to go with them. He does so, and mentions the vision as he speaks to Cornelius, saying "God hath shewed me that I should not call any man common or unclean" (Acts 10:28). Peter related the vision again in Acts 11:4-9. As the Book of Acts makes clear, Christians are not obligated to follow this holiness code. This is made clear in Peter's vision in Acts 10:15. Peter is told, 'What God has made clean, do not call common.' In other words, there is no kosher code for Christians. Christians are not concerned with eating kosher foods and avoiding all others. That part of the law is no longer binding, and Christians can enjoy shrimp and pork with no injury to conscience. On the other hand, the United Church of God (a group following the teachings of Herbert W. Armstrong) calls this an "often-misunderstood section of the Bible", arguing that Peter's statement in verse 28 indicates that the divine disclosure reflected only a teaching about people, and not one about food. The UCG argues that Peter realised "the puzzling vision could not be annulling God’s instructions." The Seventh-day Adventist Church has a similar view of this passage. Peter's triple refusal described in Acts 10:16 echoes the denial of Peter described in the Synoptic Gospels. Peter's vision was rarely shown in art, but has been illustrated with pen-and-ink drawings by Rembrandt and a variant by his pupil van Hoogstraten. Rembrandt was probably reacting to a painting of the subject by Domenico Fetti which was then in Amsterdam, and is now in Vienna. It also appears in the "Altar of St. Peter" in Seville Cathedral, attributed to Francisco de Zurbarán. ^ a b Kistemaker, Simon J. (1990). Exposition of the Acts of the Apostles. Baker Book House. ISBN 978-0-8010-5290-3. ^ R. Albert Mohler Jr. (May 21, 2012). "The Bible condemns a lot, but here's why we focus on homosexuality". My Take. CNN. Retrieved 2012-05-21. ^ a b Johnson, Luke Timothy; Harrington, Daniel J. (1992). The Acts of the Apostles. Collegeville, MN: Liturgical Press. ISBN 978-0-8146-5807-9. ^ a b What Does the Bible Teach About Clean and Unclean Meats? (PDF). United Church of God. 2008. pp. 12–13. ^ Adventist Review. 184 Pt 1. Review and Herald Pub. Association. January 2007. p. 47. ^ Witherington, Ben (2008). The Acts of the Apostles. Wm. B. Eerdmans Publishing. pp. 350–. ISBN 978-0-8028-4501-6. ^ Rius-Camps, Josep; Read-Heimerdinger, Jenny (2006). The Message of Acts in Codex Bezae: A Comparison with the Alexandrian Tradition. Vol 2. Continuum. pp. 253–. ISBN 978-0-567-04012-1. ^ Bevers, Holm (2009). Drawings by Rembrandt and His Pupils: Telling the Difference. Getty Publications. pp. 152–. ISBN 978-0-89236-978-2. ^ Soria, Martin S. (2015). "Zurbaráaan's Altar of Saint Peter". The Art Bulletin. 33 (3): 165–173. doi:10.1080/00043079.1951.11408051. ISSN 0004-3079. ^ Réveil, Etienne Achille; Duchesne, Jean (1833). Museum of Painting and Sculpture: Or, Collection of the Principal Pictures, Statues and Bas-reliefs in the Public and Private Galleries of Europe. Vol 17. Bossange. pp. 364–.